Posted on September 7, 2018 | 983 views | Topic : Featured Articles, Latest News, News & Articles, Property News. 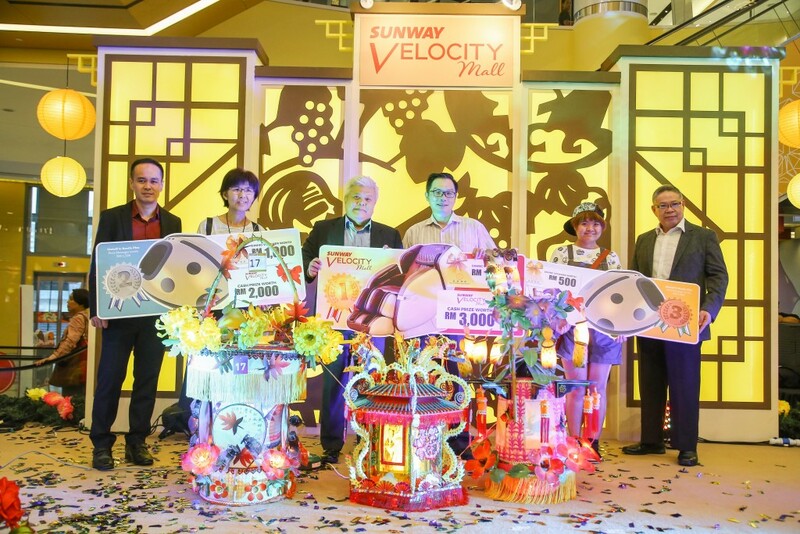 KUALA LUMPUR: In conjunction with annual Mid-Autumn Festival, Sunway Velocity Mall is holding their celebration at the shopping centre for visitors happening from September 4 to 24th September. Located at Sunway Velocity’s Ground Floor Main Atrium, the festivities will feature a vibrant, detailed and intricate set-up themed “An Autumn Reunion”. The said theme is inspired by the spirit of people reuniting with their families to celebrate Mid-Autumn with lanterns and food throughout the joyous night. Shoppers and ardent photographers can look forward to a picturesque set-up of aptly themed booths nicely complemented by an intricately designed hoist deco exuding true, festive grandeur. Sunway Velocity Mall’s signature Lantern Making Contest made a highly anticipated return as well, with registration running from 9th July to 20th August. All lanterns then had to be submitted in their physical forms from 21st – 28th August with more than 100 entries received. The most innovative, eye-catching and attractive lantern submissions are currently on display in front of the mall’s Jalan Peel entrance. The top 23 finalists will receive their prizes during today’s media launch. Of course, no mid-autumn would be complete without the evergreen mooncakes. This time, renowned household brands and vendors including the likes of Oversea, Hilton, Tai Thong, Casahana and Grand Imperial will be offering a vast selection of speciality mooncakes. Over this 21-day affair, other unique mid-autumn offerings like OTOP Taiwan’s tea and Taiwanese snacks, coffee and snacks from Doctor Coffee and a variety of traditional and modern lanterns by Pro A Lantern will also be available. Reunions will surely not be reunions without proper family-oriented activities and highlights include a Didi & Friends Meet & Greet, Tea Party along with singing and dancing sessions scheduled for 10th, 11th and 17th September. The Didi & Friends Tea Party happening on 10th and 17th September at 3.00pm are open to kids aged 4-9 so do drop by earlier and register to book a spot. Nicely complementing these are mooncake eating, tea tasting and pomelo peeling contests while the highly anticipated Little Miss Cheongsam competition on 8 September at 2.00pm for children between four and nine years old returns for the second year running. As is synonymous with Sunway Velocity Mall, a myriad of energetic festive-themed performances have also been lined up including Wing Chun displays and special 24 flower drums. Also, special mooncake workshops by 123 Bake will be available as well, which make for an ideal chance for parents to bond with their kids through this hands-on activity. And 123 Bake will also be choosing three lucky winners to enjoy free trial baking classes with them! Things don’t end there just yet as interactive online contests including “Count the Mooncakes” and also “Guess the Riddle” will be running concurrently as well. Shoppers who correctly solve the riddles can redeem prizes from lanterns to ice-creams at our Main Concierge @ Ground Floor. Speaking of redemptions, shoppers can look forward to a special partnership between Sunway Velocity Mall and Astro where every RM100 spent mall-wide in a maximum of two (2) receipts scores you a chance to “Spin & Win” at the Astro booth. Here, limited edition Astro Whoopee Plush toys are up for grabs while various celebrity and mascot Meet & Greets have also been lined up over the course of the campaign.